Shakespeare asked, "What's in a name?" His question demonstrates the nature of the ongoing Great War on the Culture of 2016---where words, or the lack of them, are the weapons of destruction. Nowhere has that been more evident than in the recent Supreme Court hearing regarding the fate of the Little Sisters of the Poor and their deeply held pro-life beliefs. While warriors on the Left redefine the meaning of good, evil, tolerance, bigotry and equality, the Supreme Court of the United States defines religious freedom by the words they choose "not" to use. Many reporters attending oral arguments in the Supreme Court sit in assigned chairs on the far left side of the chamber. These chairs stand behind a double row of massive marble columns. Brass gates, some opened and some closed, stretch between the columns; burgundy curtains, pulled back by cords, hang behind them. Given their assigned seats, some reporters may not be able to see any of the justices holding forth at the front of the chamber. All they hear are their voices. As the case was laid out by the lawyers, far Left champion warrior Justice Ruth Bader Ginsburg's words were heard echoing from the marble columns, the brass gates and the burgundy curtains. She said, "No one doubts for a moment the sincerity of the belief of your client [Little Sisters of the Poor] and all the others, and since sincerity of their belief is accepted, it's off the table." This case is, simply stated, about government forcing organizations to carry insurance that covers sterilizations, contraceptives and abortion inducing drugs and devices---something the Catholic Little Sisters and the Protestant owners of Hobby Lobby find a violation of their right of free exercise of religion. Tens of millions of American citizens hold these same beliefs. Following Ginsburg's words, the voice of Justice Sonia Sotomayor echoed through the chambers. She asked, "How can the government function if it cannot demand people do things they believe will damn their souls? Because every believer that's ever come before us, including the people in the military, are saying that my soul will be damned in some way." She continued, "I'm not nay saying that, that is a very substantial perceived personal burden by them, But if that's always going to be substantial, how will we ever have a government that functions? How will we ever have anything that the government can demand people to do in objecting...that won't be a problem?" Jeffrey notes the First Amendment itself answers Sotomayor's question--"Congress shall make no law respecting an establishment of religion, or prohibiting the free exercise thereof." When the government forces pro-life Christians to buy health insurance plans that include the anti-life coverage, they are denying Christians the "free exercise" of religion. However, a look at the transcript---the words of the Court---not one word includes the term "free exercise" of religion. This is because the far Left warrior activists on the Court have decided to "not" use the words of the First Amendment. Rather they have chosen to use the words of the Religious Freedom Restoration Act of 1993. 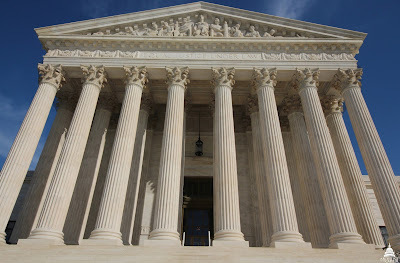 That Act says, "Government may substantially burden a person's exercise of religion only if it demonstrates that application of the burden to the person (1) is in furtherance of a compelling government interest; and (2) is the least restrictive means of furthering that compelling government interest." We remember the Hobby Lobby case a couple of years ago regarding this same matter. A 5-4 majority--Chief Justice John Roberts and Justices Alito, Thomas, Kennedy and Scalia---ruled that the Obamacare regulation was a substantial burden on the religious exercise of Hobby Lobby's owners, because they are biblical pro-life Christians. But that majority also "assumed" that the government was furthering a compelling interest with the regulation. Where the government failed in the Hobby Lobby matter was in convincing 5 justices that it was furthering its compelling interest by the least restrictive means. To successfully surrender the "free exercise of religion," all the government needs is one more far Left word warrior on the Supreme Court. And we are 1 election away from that becoming a reality. No one questions what Hillary or Bernie will do to the Court, with as many as 4 justices leaving the Court over the next 4 to 8 years. The question looming over our country, our culture, our freedoms and the freedoms of our children and grandchildren is, "What will you do?" There is only one way to ensure that the Supreme Court will defend not only the free exercise of religion, but every word of the Constitution. The prophet Hosea (ch.14) writes about the restoration of his country. Speaking for God he tells his countrymen, "You have stumbled because of your iniquity...take your words with you, and return to the Lord, say to Him 'Take away all iniquity, Receive us graciously, for we offer the sacrifices of our lips." Words and the lack of words are powerful---to save and to destroy. Am I hearing this right, that Ginsburg's words tell us that what we believe, knowing full well what we believe, means nothing at all in matters pertaining to our faith and the protection of it? Are these justices drunk? They seem to be telling on themselves, are they not? They are telling us what their problem is. They deliberately will not hear matters pertaining to the protection of religious freedom. They care not about our 1st amendment rights. They threw the 1st amendment off the table, just swiping it away. The government must listen to reasons why people believe their souls might be damned. These judges are required to hear such things and decide if these people are sound and honest in their reasons. Yes, it may be much easier for some judges to toss our rights aside, and do whatever they want to, but our constitution isn't written that way. They are going to have to get down on their knees and pray about things when the going gets tough. If somebody can not make a coherent argument as to why they believe as they do, then they don't have to accept what they say as being legit. This they may have to do with every single objector, because they can not just make a one rule or law that fits all people, for it's just not that simple on matters pertaining to how each person believes. They are required to see how each person has walked out reasonably their belief system, their value system, are they not? What? ...Did we just not pay them enough or what? What's the problem? We need some responsible judges, ones that have some sense. Some of these should be impeached. Some of these shouldn't even be there already. Some people have been forced to serve in the military, and were put in positions where they would not have to use a weapon and kill anyone, rather they served in other ways and did so wonderfully. There may be some who think that the entire work of the military is wrong, and be against everything, and I will wonder then, do they pay their taxes during such times, for their tax money will be used to pay for the war time expenses, and they will still be found to be supporting a war that way. All these things have to be sorted out on an individual basis. Yes, there will then be a few who will find out what works and use the system deceitfully for whatever they want. Good judges will have to try to honestly discern these. It's not an easy job, but who said being a Supreme Court Justice was supposed to be easy? If they want easy, they should do something else. Our Constitution must be allowed to trump any '93 act or whatever. Sounds to me like the '93 act itself is wrong. It's up to "we the people". Let's get on the candidate's face book sites and just start teaching the truth about things, as Gary does here. Truth works. Let's just let the truth do it's work. It may take time. Let's give it time, our time. It's our time now. Let's not waste it. I suppose a court can't hear every single case if it's about the same thing. They really shouldn't have to, but in questionable things, they should be hearing quite a few. If these judges want "easy", maybe they should wash dishes, drive a truck, pound nails, carry lumber, fix cars, whatever, and maybe after some of that, they might decide that being a judge in some difficult cases, really wasn't that difficult after all.